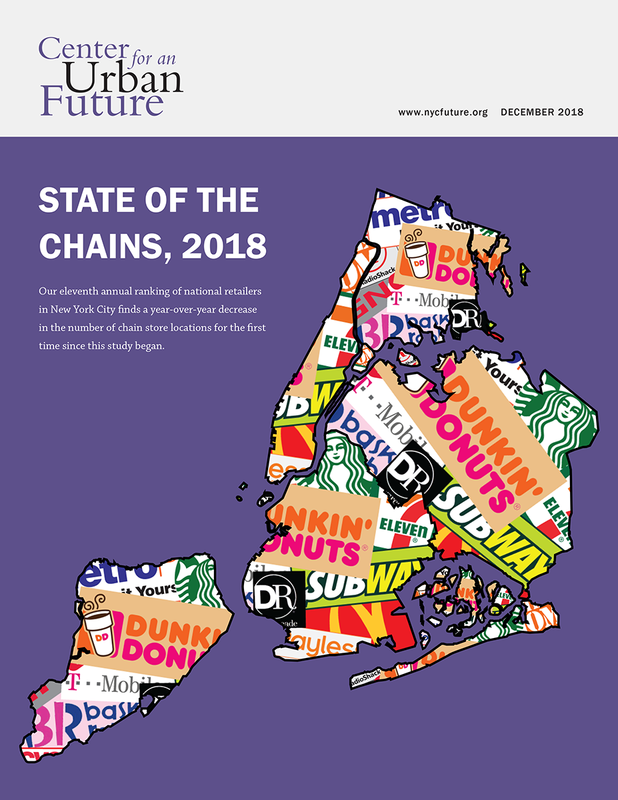 The eleventh annual ranking of national retailers in New York City by the Center for an Urban Future (CUF) just came out, and it reveals a 0.3 percent decline in the number of chain stores over the past year, marking the first year-over-year citywide drop in national retail locations since they began the annual analysis of the city’s chain retailers. You can see the full report here. The report breaks out chain stores by zip codes, which is useful but also has its limitations, given the lack of correspondence between zip code and neighborhood boundaries. Even so, there is good news for the zip codes that overlap with Greenwich Village, the East Village, and NoHo. Four of our five zip codes saw a decrease in chain stores, while one saw an increase of less than one percent. And the further good news is the decreases in our zip codes were larger than the city-wide or borough-wide figures. So first, the bad news, which really isn’t so bad. Only one of the zip codes in our area saw an increase, and it was less than 1%. 10011, which includes much of the Central and West Village between 5th and Greenwich Avenues saw an increase of only one chain store from the prior year. But keep in mind that much of this zip code lies north of 14th Street, and includes the already chain-heavy 6th Avenue and 23rd Street corridors. Map of zip codes from unhp.org by way of mappery.com. The 10014 zip code, which falls entirely within the West Village, saw a 13% decrease in chain stores. Last year there was a 2% decrease in the number of chain stores, according to the 2017 report. And the 10009 zip code, which covers the East Village east of 1st Avenue, as well as Stuyvesant Town and Peter Cooper Village, saw a decrease in chain stores, down 7%, for the second year in a row. The 10012 zip code, which includes much of the Village south of Washington Square, northern SoHo, and NoLIta, also saw a 4% decrease in the number of chain stores. Finally, the 10003 zip code also saw a 3% decrease in chain stores; this covers most of NoHo and the East and Central Village from 1st to 5th Avenues, 14th to Houston Street, though it also includes the chain-heavy Union Square and East Flatiron areas. According to the report, the East Village 10003 zip code has the second-highest number of chain store locations at 173 (down from 179 last year), so it is starting from a high number. Nonetheless, the zip codes covering our neighborhoods continue to, overall, have one of the lowest concentrations of chain stores in Manhattan, with most of the Manhattan zip codes with fewer chains covering a much smaller area and/or having many fewer stores than the retail-heavy East Village (the report counts and ranks the number of chain stores, not their concentration, i.e. how many chain stores are in an area as a percentage of the overall number of stores; thus a zip code may actually have a very high number of chains but a relatively low percentage, and vice-versa, depending upon how much area it covers and how many shops there are in the area). GVSHP organized a walking tour as part of the Shop Bleecker initiative to draw attention to the architectural and cultural history and the small local businesses on this quintessential Village corridor. We’d like to think that the broad efforts in our neighborhoods to combat chain store proliferation and the support residents show for local, independent, home-grown businesses is part of the reason our neighborhoods have trended towards less formula retail chain stores. In 2018, the report found that Starbucks had more stores in Manhattan than any other national retailer, with 227 locations. But just this month Starbucks on Broadway and 9th closed, so that is one less. That corner space previously housed Silver Spurs, the diner that closed in December 2013 after a rent hike helped end their 34 years in business. But the loss of independent businesses does not have to be a foregone conclusion. GVSHP is helping to spearhead a drive to get zoning protections in our neighborhoods that would limit or prohibit chain stores in certain areas. We have been working with Community Board #3 (East Village/Lower East Side/Chinatown) since 2014 to make supporting and maintaining diverse and unique homegrown businesses a priority. In June of 2017, over 100 local residents and business owners attended a public forum at the Board to support the need to foster diverse and independent businesses in the neighborhood. The idea is to reverse the “dramatic loss of small ‘mom & pop’ businesses in the past 10+ years”. One way to do that is through the designation of a special district, which is a zoning overlay used to supplement and modify the underlying zoning in order to respond to distinctive neighborhoods with particular issues and goals. Examples of various types of special districts can be seen across the city, including on the Upper West Side, Battery Park, Harlem, Hudson Yards, and Little Italy. There is a proposal which GVSHP is helping lead the effort to seek implementation of for a special zoning district in the East Village that would limit the proliferation of chain stores (more on that proposal here). After the proposal seemed stalled for a bit, the board has again begun to move on the proposal, which has widespread local support. GVSHP has garnered almost 300 signatures to date in support — add yours here. This year it is expected that an official proposal will be forwarded to the city for consideration. If we are successful in the East Village, where there is an existing independent merchant’s association that has supported such measures, we hope to be able to pursue it in other parts of our neighborhood as well. Working to preserve small, independent businesses is a top priority for GVSHP in 2019. Sign the petition to create an East Village Special Retail District. Nominate a “Business of the Month”, spread the word about our past Businesses of the Month awardees. And check out the Get Local guide by our friends at East Village Community Coalition, it is also their 11th edition! 1 Pings/Trackbacks for "Good News on Chain Stores for the New Year"